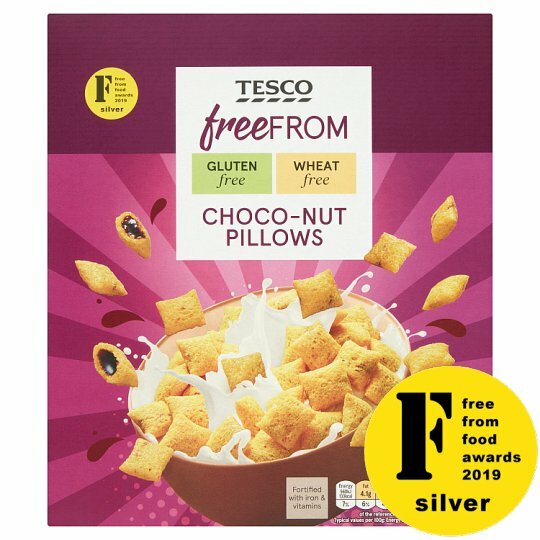 Gluten free cereal pillows made with rice flour, gluten free oat flour and cornflour with a hazelnut and chocolate flavoured filling, enriched with vitamins and iron. INGREDIENTS: Hazelnut And Chocolate Flavoured Filling (34%) [Sugar, Palm Oil, Hazelnut Paste, Lactose Reduced Whey Powder (Milk), Cocoa Powder, Cocoa Butter, Milk Proteins, Milk Concentrate, Emulsifier (Sunflower Lecithins), Flavouring], Rice Flour, Oat Flour, Cornflour, Sugar, Fruit And Vegetable Extracts [Carrot, Pumpkin, Radish, Apple, Blackcurrant], Salt, Iron, Niacin, Pantothenic Acid, Vitamin D, Riboflavin, Vitamin B6, Thiamin, Folic Acid, Vitamin B12. Contains milk. Also, may contain peanuts and other nuts. For allergens, see ingredients in bold. Store in a cool, dry place., To retain freshness fold down inner bag after use.